Business owners know how important a conference is. It needs to be effective so that the important matters are covered and will result to increase the chance of business success. However, many of them fail to conduct effective conference. That is because they forget to use a powerful tool, a conference agenda. 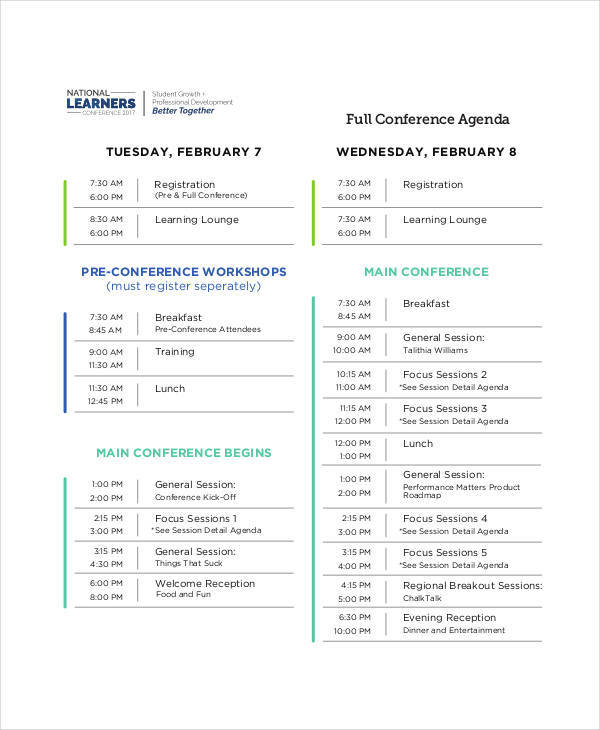 A conference agenda is more that just a learning agenda and a list of activities need to be followed in a conference, it also provides important information and matters that will be useful in the development of a business. Yes, it is a powerful tool for managing an effective conference. Without these, a conference will lose its importance. We have all been to a conference where it is not what we expected. The organizer and staff are unprepared, the participants are clueless, and the topics discussed are just a waste of time. The main cause of these problems is none other that a poor agenda design. 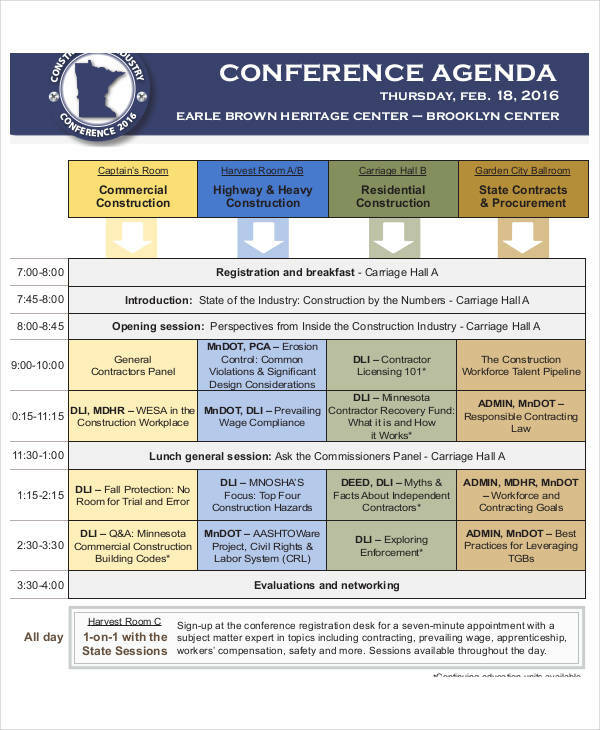 An effective agenda design sets out clear objective for the conference. It will provide the things that are needed before and during the conference and helps the team to prepare and allocate time wisely. 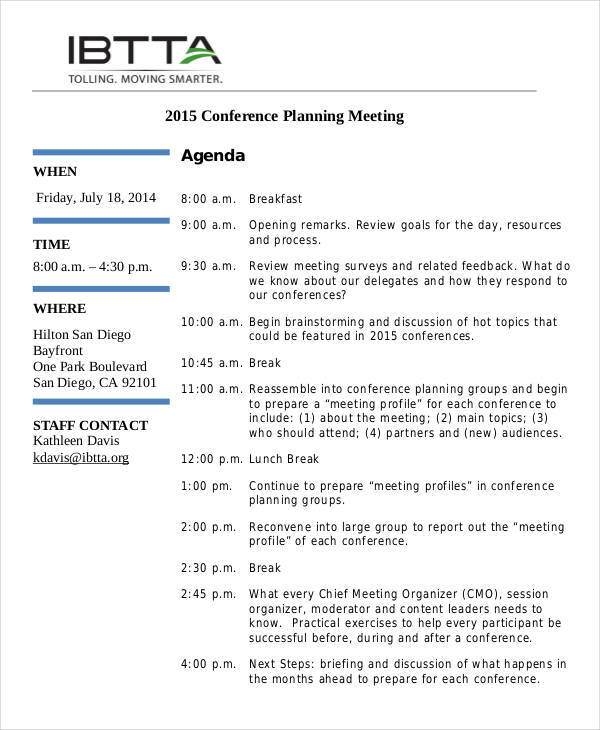 Here are some few tips in designing an agenda for an effective conference. Get suggestions from your team. Since you are all part of the same team and your only goal is to provide an effective conference, seeking inputs from the team will not hurt. Include items on the agenda that also that reflect their needs. Choose a topic that will benefit all. The topics in your conference should not only affect you but also benefits the whole team. Set a realistic time for each topic. This is important. You need to set a specific time for each topic so that the team will have enough time to answer, address, and resolve issues that are brought up in the conference. 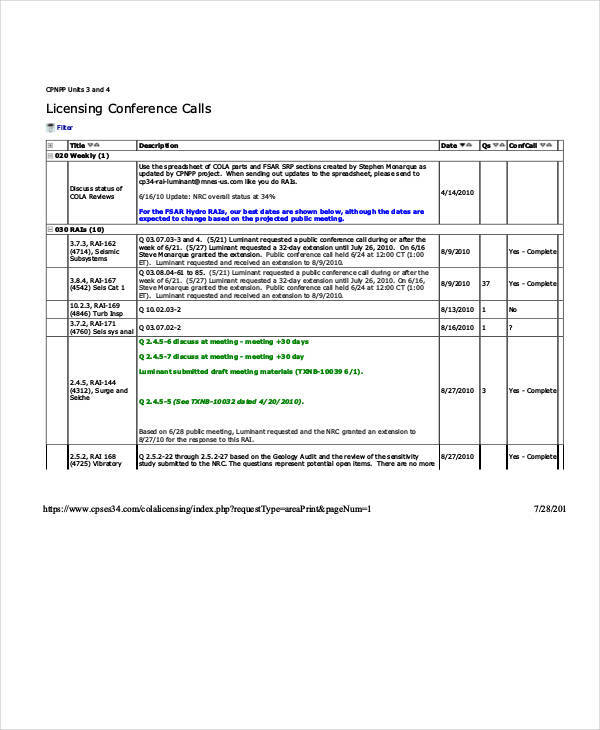 You can also check out our meeting agenda example to give your more tips and guidelines. Writing a conference agenda is not easy, but following these tips will help you create a winning conference agenda. Write the conference agenda ahead of time. Writing it advance gives the attendees and the team enough time to prepare. Provide the important details. Write the time that the conference should start and end, who are the attendees, and the place and date of the event. Determine the objective of your agenda. Once you establish the objective, you can now prioritize the topics from least to most important. Learn the conference. This is the foundation of a successful conference agenda. You should know what is the theme of the event, who are the audience and what organizations they come from, and how your knowledge and expertise adds value to the conference. Write a conference agenda from the audience’s perspective. By knowing who your audience are and who will read your agenda, you can decide what session is relevant and significant to add to the agenda and what session best resonates with those attending the conference. How the audience will engage in the conference should also be included on the agenda. This is important because an effective conference sessions are very engaging to the attendees. The attendees will be more active with facilitated discussions that plain lectures. 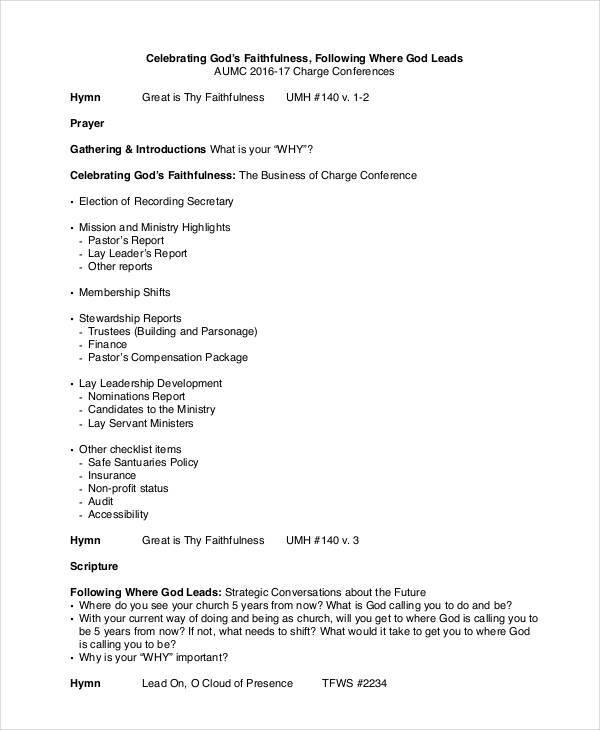 Your conference agenda should reflect that. Try something new in your agenda. Don’t stick to the same old process of a conference. Try something innovative. You can include a debate, funny or passionate presentation, or a poster session. Consider the end goal. What’s the benefit of the audience attending your session? How can they use the knowledge they will get in your session to their work? Your conference proposal should answer those questions. This will play a vital role in attendees deciding to attend your conference. To provide you with more tips on writing and effective agenda, browse our agenda in Excel and our agenda in Word. An agenda is not just a list of things to do, it is also designed to cover all important and relevant information. Without these, the conference will result in a chaotic session and all the important business may not be covered. 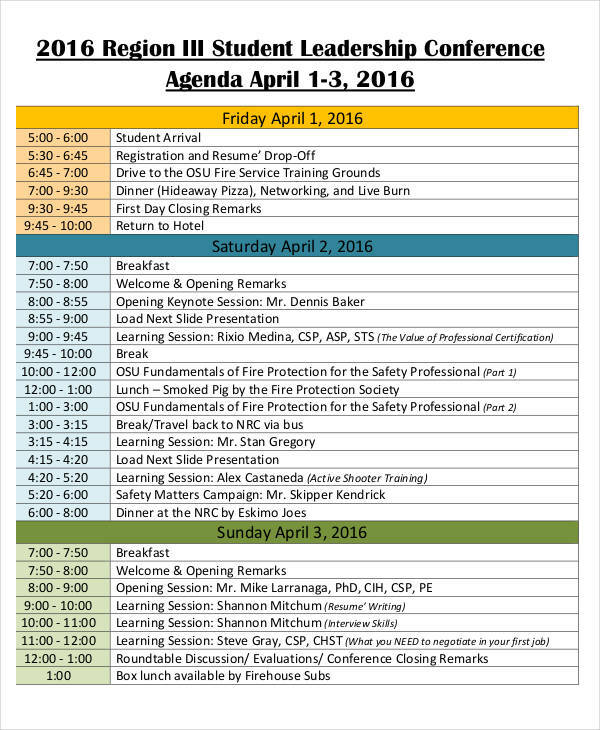 Here are some of the few reasons why an agenda for a conference is important. Ensures that the conference stays on track. 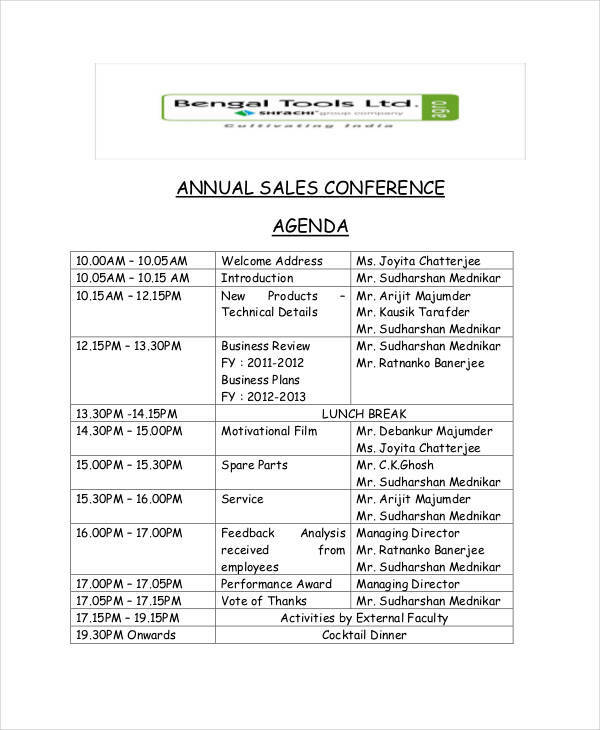 With the help of a conference management agenda, the session on the conference will be followed accordingly. Gives everyone, including the team, an idea of what is going to happen next. 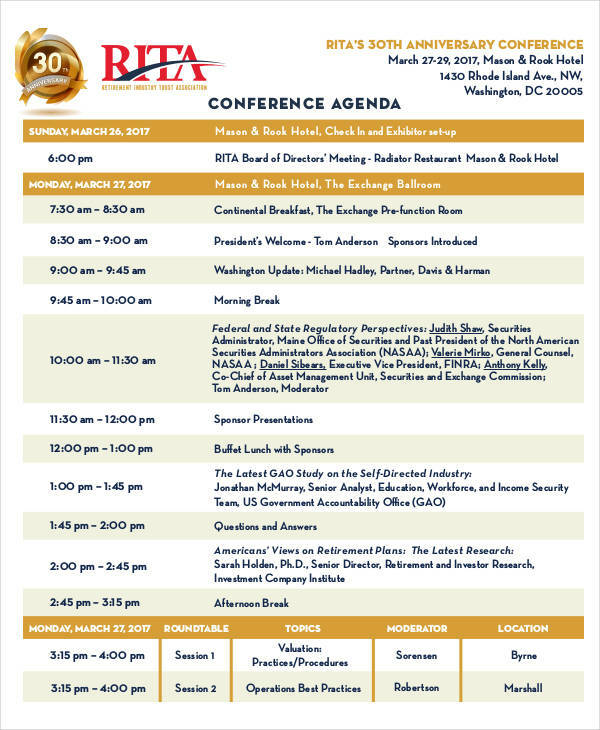 A conference agenda provides a list of topics or sessions that are arranged according to their development. Provides a logical guide for the conference session and the all the topics discussed. 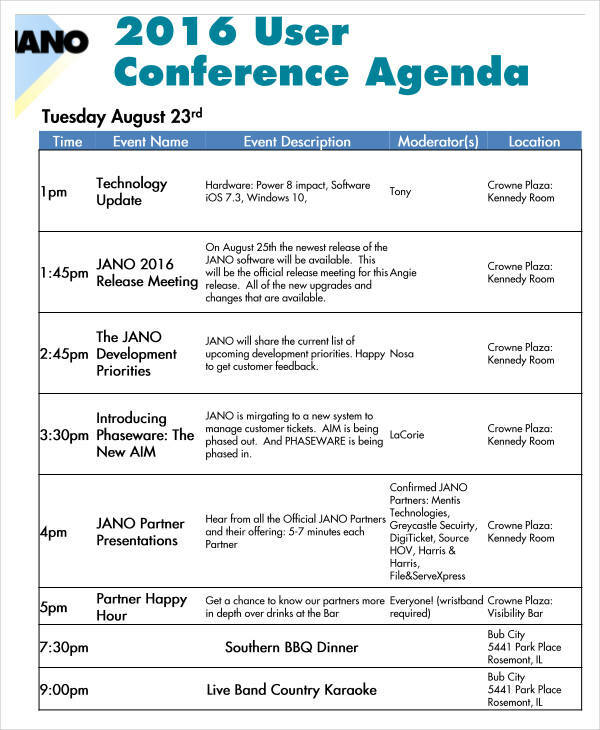 A conference agenda is also helpful to guide the attendees and the team logically to the whole process. Brings harmony and efficiency to a conference. 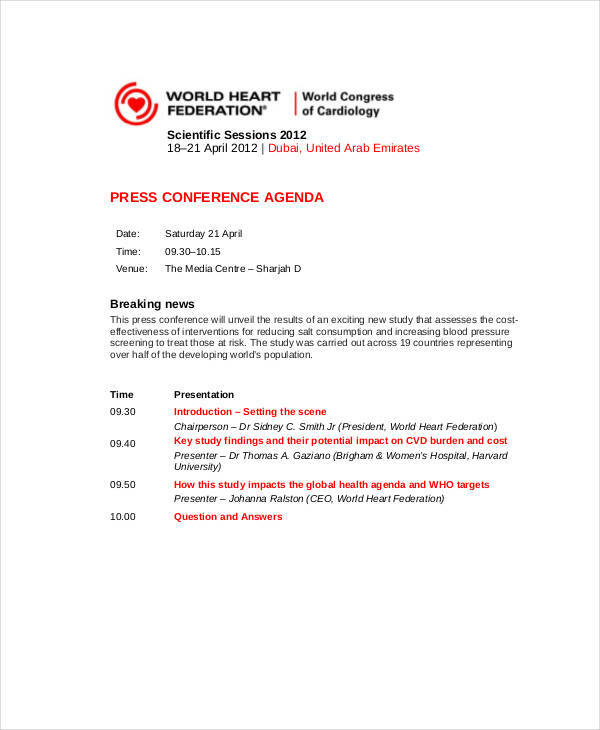 With a well-designed agenda, the conference will be effective and will result in a productive and successful meeting. 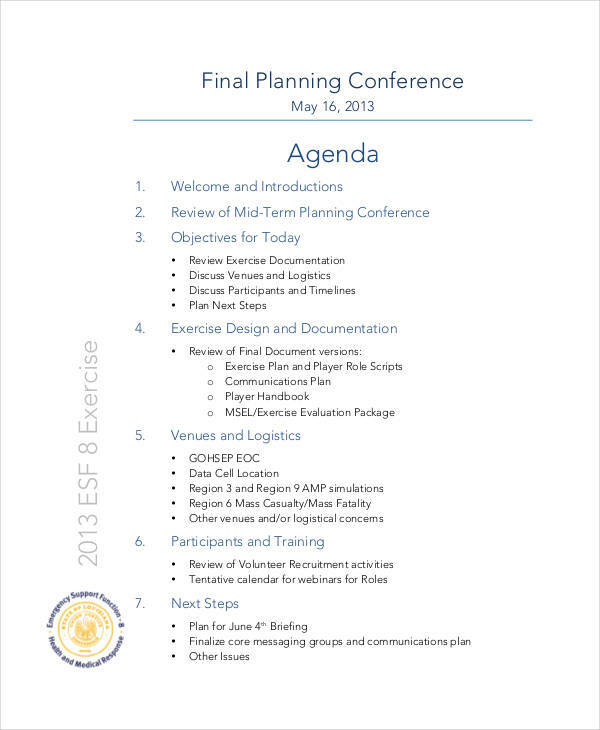 You can see for yourself the importance of using an agenda in a conference by downloading our printable agenda examples here. 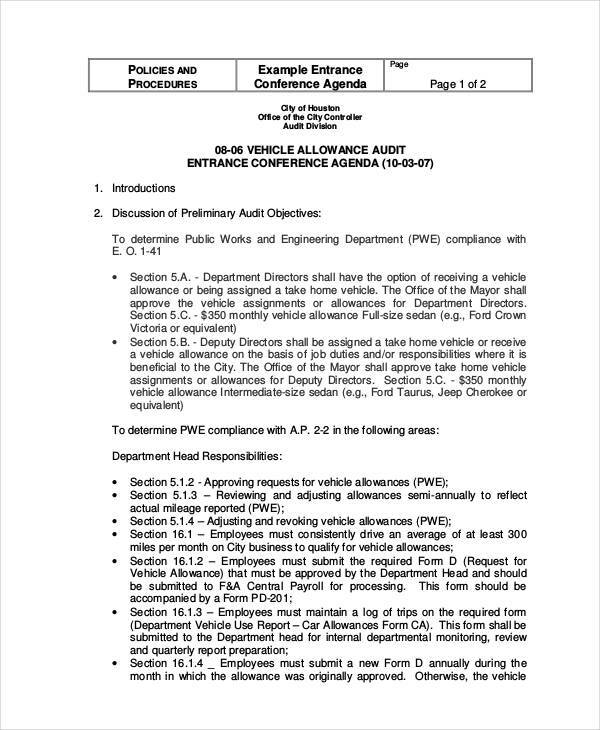 We also have business agenda available if you are on the lookout for them. 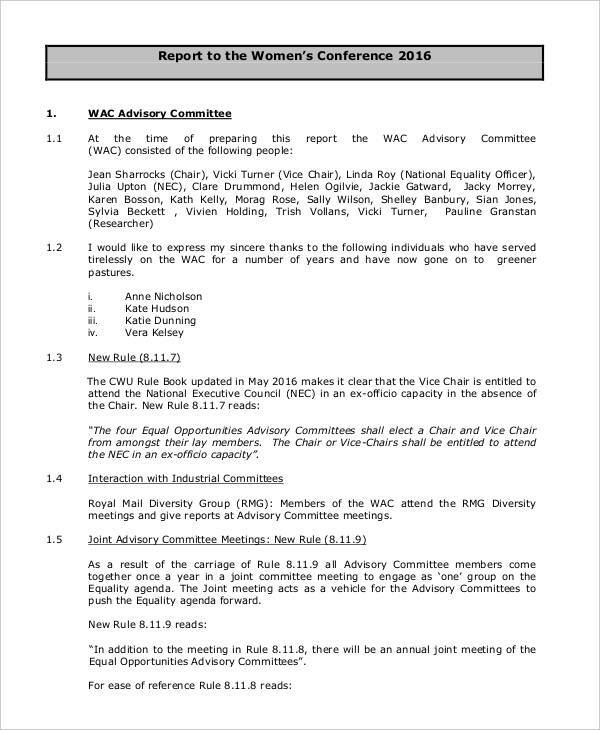 There is no rule for creating an agenda and it is entirely up to the management on how and what would they include in the agenda. 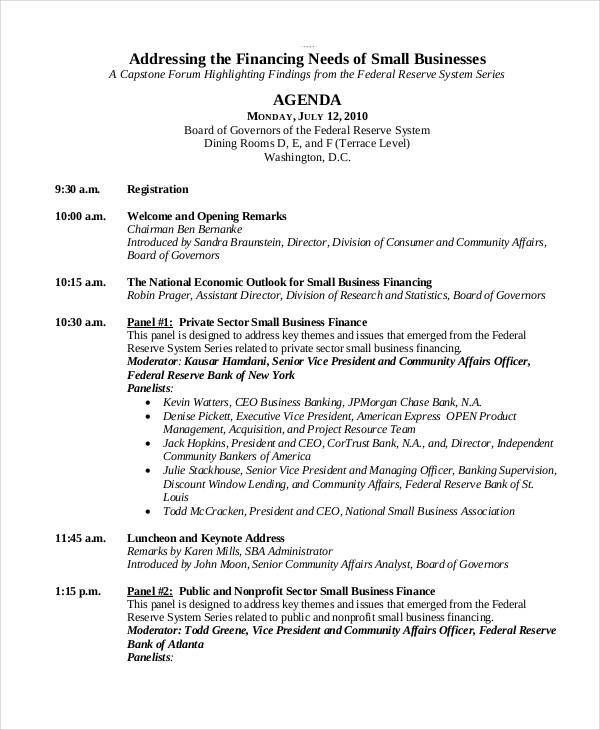 However, most of the conference agenda follows a basic business agenda format. 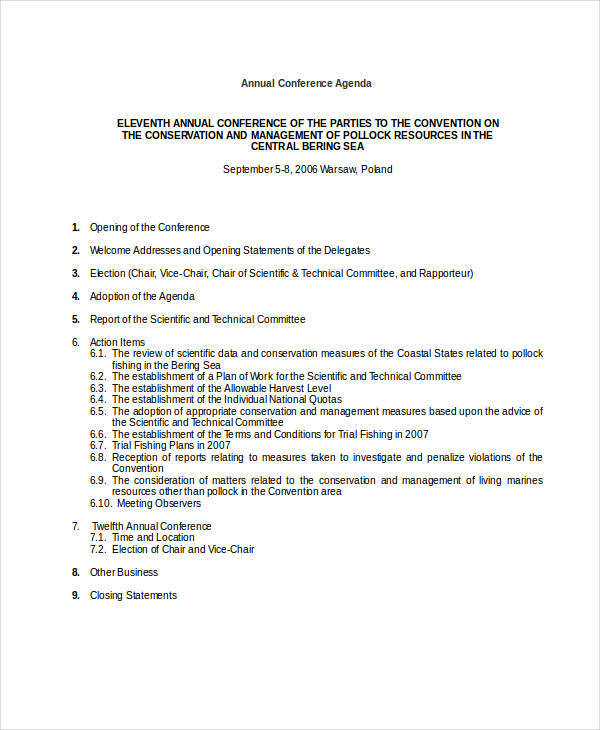 Here is the common format of the conference agenda. Conference agenda title. You should a provide a title for your conference agenda. 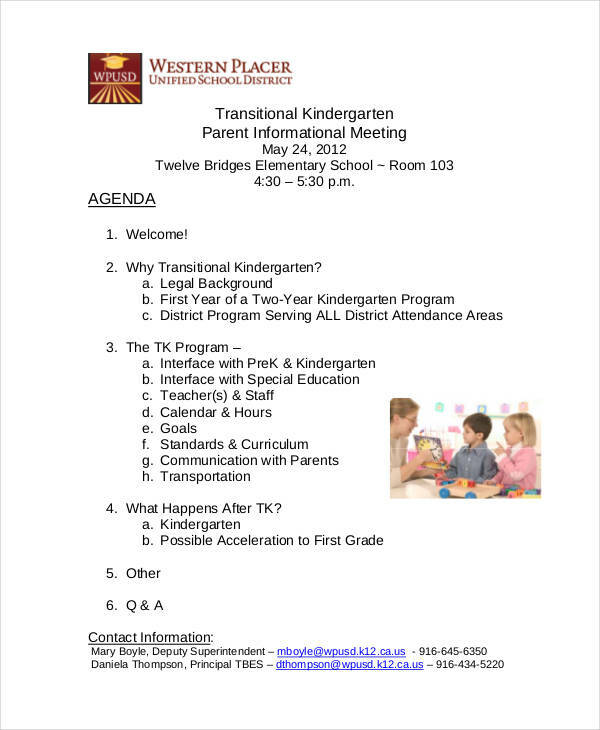 Include the who, where, and when information. Who will attend, where it will take place, and the time of the conference. 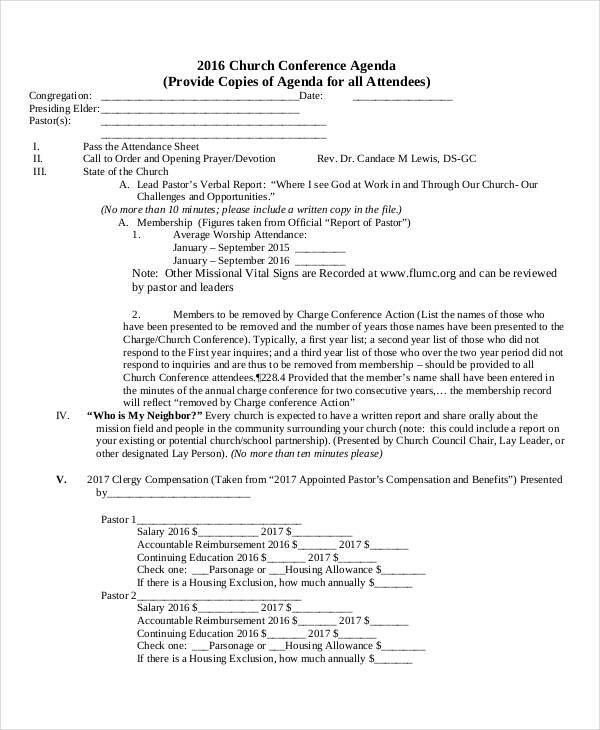 Provide a summary statement of the conference objective in your agenda. 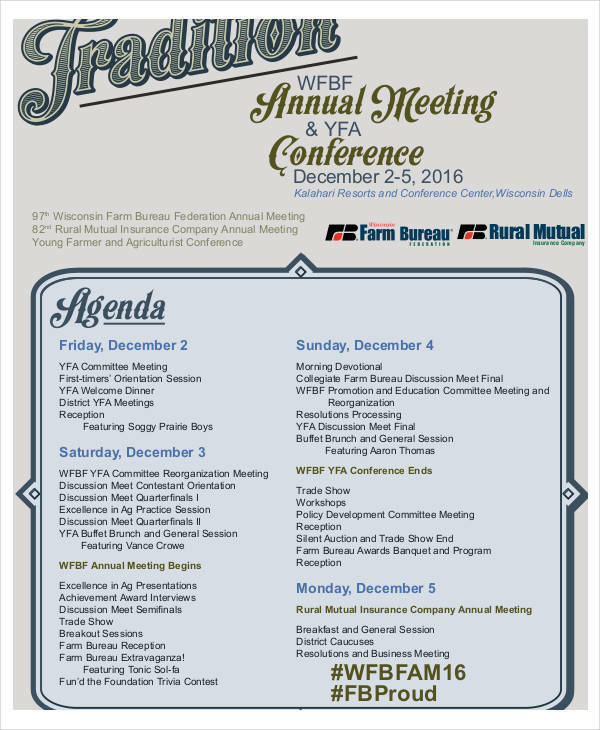 This includes the overview of the conference and the summary of the topics that will be discussed. 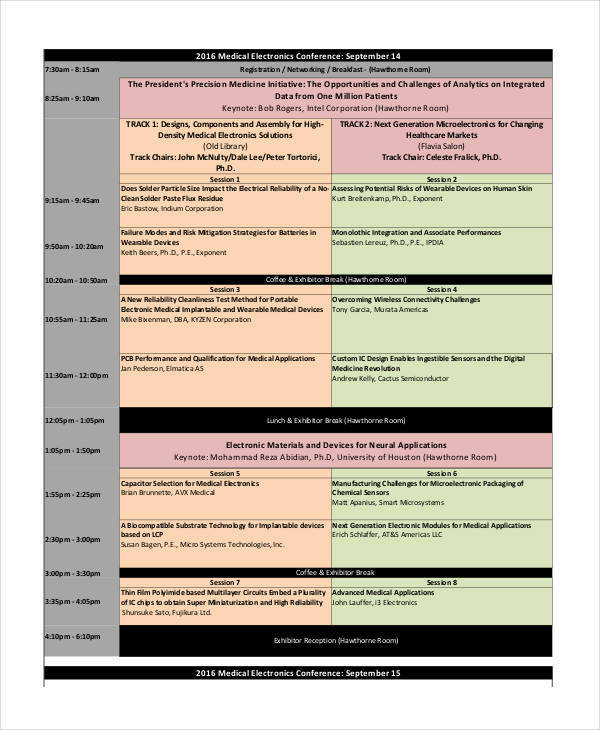 Write a schedule for the different sessions of the conference. Arrange them according to their level of priority. Allocate the time for each session or topics. Make sure that the run-time of the session or topics follows accordingly. Provide extra time at the end of the conference. 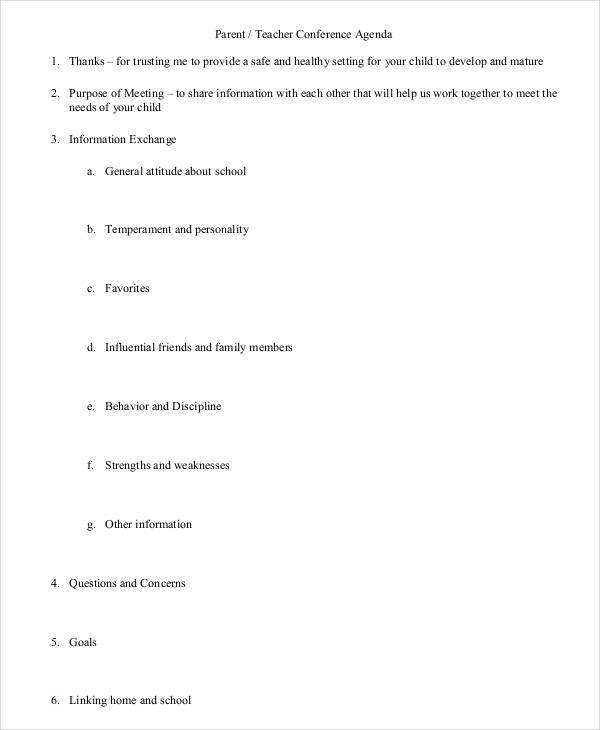 This is useful for the question and answer session and for other purposes including deliberation. Review your agenda before distributing it. This is to prevent from errors including the typing, grammar, and spelling errors. This is also to ensure that all important matters are covered.